Different people enjoy different aspects of American Dance. Colin will try to cater for all tastes: some energetic, some tricky, some traditional. I taught “Introduction to Squares and Contras” at Southam last year (2008) using some of the notes for Square Dance Technique and Contra Dance Technique and also did a session called “200 Years of American” which traced the development of American Dance from the Playford-style longways dances to the Cotillions and Squares and traditional contras, through the squares and contras of the 1950's and on to modern Squares and Contras. I'm not going to repeat all that, but I do want to think about the title “American for All”. Even if I cut down “American” to mean “Squares and Contras” there's still a lot of variety in each category. Squares can be the simple figures we tend to call “Running Set”, where one couple leads a figure with each of the others in turn such as “Bird in the Cage” or “Little Side Door”. They can be Southern Squares which are danced to fast unphrased Southern reels. They can be the New England Quadrilles, with a 32-bar figure and a 32-bar break. They can be Modern Western Squares, with hundreds of new figures and ever-changing choreography often improvised by the caller. Similarly with Contras you can get the old ones, from the Ralph Page Book of Contras for instance, which are much like 18th century English Country Dances. You can get the traditional Contras like Devil's Dream and Bucksaw Reel and others from the Community Dance Manuals, where you tend to do more with your neighbour than your partner, and you can get modern contras where it's an all action aerobic workout with a partner swing and a neighbour swing in every dance. All of these are “American”, but a lot of people think their brand of American is the only right one. Let's try and hold back on our prejudices and look for the good in each of these. Wendy Crouch, who started the Southam Festival, didn't like American at all, though she was sensible enough to realise that other people did, and always booked good American-style callers. Wendy said American was boring. I suppose another objection might be that it's too energetic, though Wendy was happy with traditional English so she wouldn't have thought that. And some people don't like American-style music, and feel that the Playford-style tunes make the dances so much more satisfying. I'd like to know who at this workshop is not very keen on American, and please try and explain why. I promise I won't pick on you for the rest of the weekend, but I might just be able to change your point of view. One point made was that contras go on far too long and that's why they're boring. I can certainly sympathise with this view, but Elvie Miller (from the band) pointed out that contra dancers in the States put in lots of extra twirls and flourishes to vary the dance, so they're not doing it exactly the same every time through. And I added that bands in the States pile on the excitement which makes you less aware of how many times you've done the dance. As with many things in life, you get out of dancing what you put into it. Let me demonstrate the way some couples do a balance and swing followed by lines forward and back. I accept that if you're unwell or infirm you might need to dance this way, but I don't believe most people are — they just don't want to put any effort into it. Maybe people think a swing is too energetic — but it doesn't have to be. 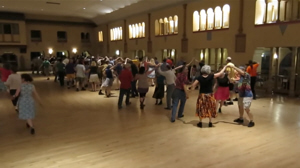 Although contra dancers in America say the swing is the most important part of the dance, they often use part of the time for twirling rather than actually swinging. Let me demonstrate. And then you try it. And you can do a walked swing rather than a pivot (buzz) step, provided you put a bit of life into it. You can even do this while the other person is doing a pivot step. What you can't do is rotate at different speeds — there needs to be some adjustment. Men — if you've got any awareness of body language you can sense when the lady doesn't want to do a fast swing — don't force her to move faster than she wants. Also known as Vinton's Hornpipe. See the instructions here. This comes from the Ralph Page book of contras, but the version done in England is a little different. It was originally triple minor, and it's much like an 18th century English dance — it was originally published in Boston (USA) in 1890. We do it as duple minor, which means the ones are also the threes of the ones above them, which causes endless confusion and amusement. See the instructions here. By contrast, here's a dance by Cary Ravitz, who specialises in tricky contras. On his website he gives rules for writing contras — such as you need a partner swing and a neighbour swing — but within these constraints he manages to weave some fascinating patterns which keep you on your toes — especially when you're near the end of the set. This one is a change partner dance too. Most modern contras flow very smoothly — you never have to turn back on yourself and you're almost always connected to people. It's about giving weight and working as a team — just as Playford is. The roll away into the circle right is fine so long as the men lead their partner from one move into the next — don't stop dancing at any point or you're dead! In fact it's a feature of modern contras that you never stop moving — which some people like and some hate. I'll admit there are times when I'm very glad to have four bars rest while the ladies do a do-si-do or a right-hand turn. I like the flow of this dance; I like the fact that several times you're turning away from one person to do the next move with someone else. Of course it means you have to think ahead — some people don't like that! You can't do a figure, stop, reassess the stuation and then decide what to do next. And you have to stay awake at the end of the set — just keep doing the dance and you'll be fine. Now let's look at Squares. Many contra dancers in the States don't like Squares, because they have to think too hard (though they wouldn't put it like that). Again I want to bring out the variety, so we'll start with one which is traditional in style and has many variations. The figure is done by two couples at a time, either Heads or Sides — the others just stand there and watch. Contra dancers don't like standing and watching — that's why you don't get the ones leading down the centre and back in modern contras; it's always leading down in a line of four. In my view you're still part of the dance whether you're moving or not, and you take an interest in what the active couples are doing. You could even learn by their mistakes! Of course there's a break at the beginning, middle and end where everyone's moving. I love it when the caller varies the break every time to keep you guessing, but some people clearly don't, so I'll do the same simple break all three times: allemande left, grand chain, promenade, swing. I learnt this one from Kathy Anderson, and I don't know who it's by, but it's too busy to be traditional. In fact it's so busy that I've removed a courtesy turn at the end of A2 because I couldn't fit it in. Some people like busy dances, some don't, but at least accept that it is busy and don't be caught off-guard every time. You've got to know who your corner and partner are at each turn of the dance — there's no time for a choice! And I'm going to vary the breaks too. See the instructions at www.quiteapair.us/calling/acdol/dance/acd_122.html. A modern contra by Russell Owen which flows beautifully. You can do some spinning in this one — again some people love it and some hate it. In the States they go in for spinning in a big way, but you can take it or leave it; it won't affect the other dancers that much. However, since this is a workshop I would like you all to try the spin, at least in the walkthrough. You're spinning while changing position, so make sure the change position is really what you're thinking about. If I'm in a wave and I want to move to my right to change places with the person on my right, I take a very positive step to my right on the first beat and on the second beat I need to pull my left foot round so that I've turned through 180º. If I don't, I'm in dead trouble when it comes to making the third step. It's just a turn single while travelling a short distance. And do make sure that when you move to the left you pull your left shoulder back — it really is easier. If you get disoriented, just remember that the balancing and spinning gets you right back to where you started it — you're in your progressed places at the end of the hey. See the instructions at www.cambridgefolk.org.uk/contra/dances/ruth_ungar/wizards_walk.html. Finally a dance by Ruth Ungar, written when she was about twelve, to fit a tune written by her father, Jay Ungar. It's a terrific tune, but it needs a very good band to play it! I didn't call this for some years because of the final part — the “Wizard's Walk” move — which has everyone moving backwards at a couple of points. As she wrote it the twos just moved in and out, but I've always met it with the twos moving also.